Waking up amongst tall redwoods is a great start to a day. I made breakfast while the others slept. I talked for a while with David from Calgary. He works in the Canadian oil fields for $18/hour through the winter (dark and cold) months and travels in the summer months. Once up and moving, we had another 12-15 miles on the Avenue. Also a great start to the day, even with the added weight. The new plan, since getting to Fortuna required detouring and riding 10 miles on the 101 which may not be allowed, was to ride 55 miles to Eureka where there were three listed bike shops. The ride was okay, with a couple stiff climbs (up to 12%), and into an increasing wind, no surprise. We got to the shop about 2:00, and pleaded for help. 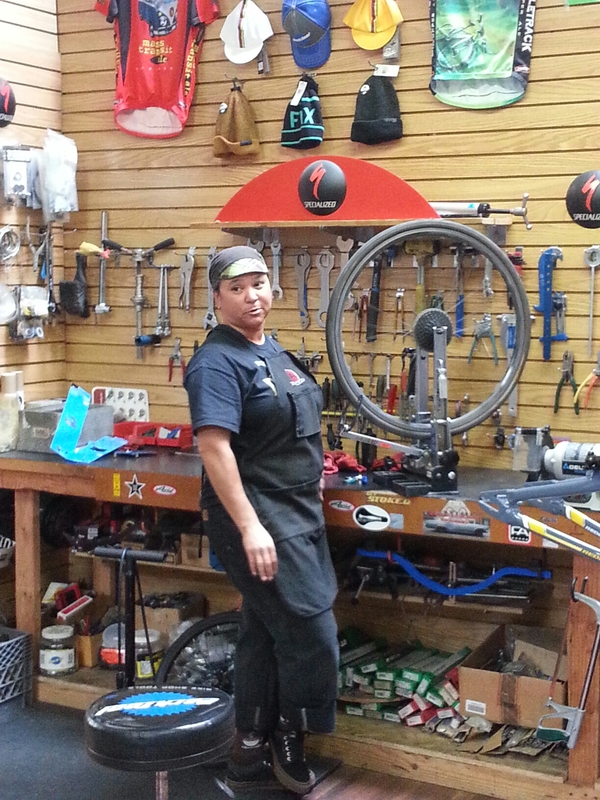 Our mechanic, Stella, had been working as a wrench for the past 20 years, starting in her parents store. She let us try her whip and cassette tool, but I couldn’t break it. She tried with a bigger whip, the tool mounted in a vise and using a big honking fork straightening tool for extra leverage, no luck. As a final effort, I took the wheel outside, lit my Jetboil stove, torched the cassette until the grease started smoking and the spoke protector melted, then brought back to Stella to try again. Success!! If that hasn’t worked, we were hosed. Stella replaced the spoke, trued the wheel and put the cassette back on… $21. Our Guardian Angel in her element. We stopped for a deserved brew at Lost Coast Brewing. 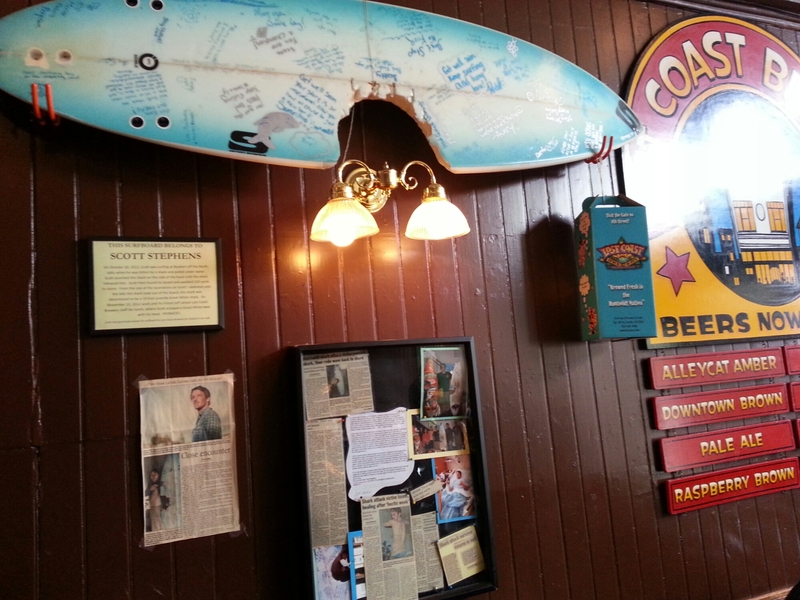 They had a surfboard on the wall that had a huge shark bite out of it. Seemed for real, they had newspaper clippings. We had a warm showers host outside of Eureka, Albert. 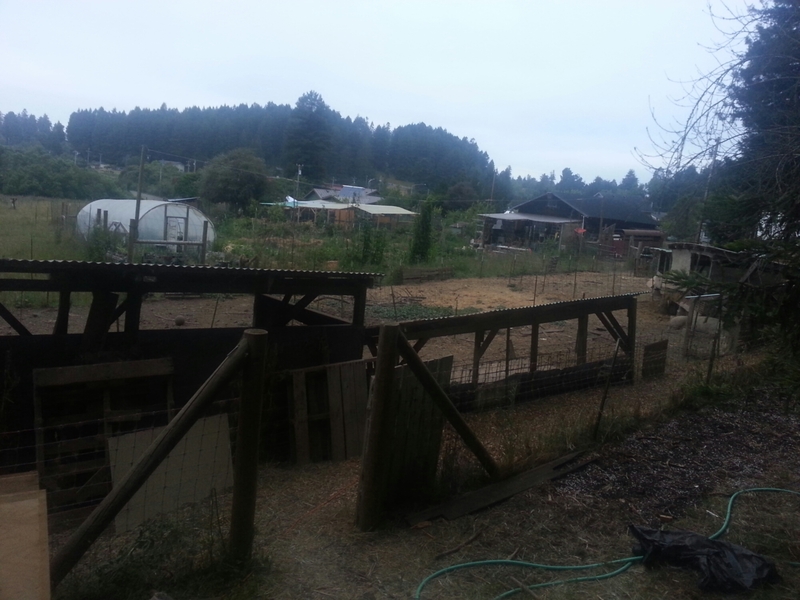 Albert has an organic farm, Blue Blossom Farm It is really basic. 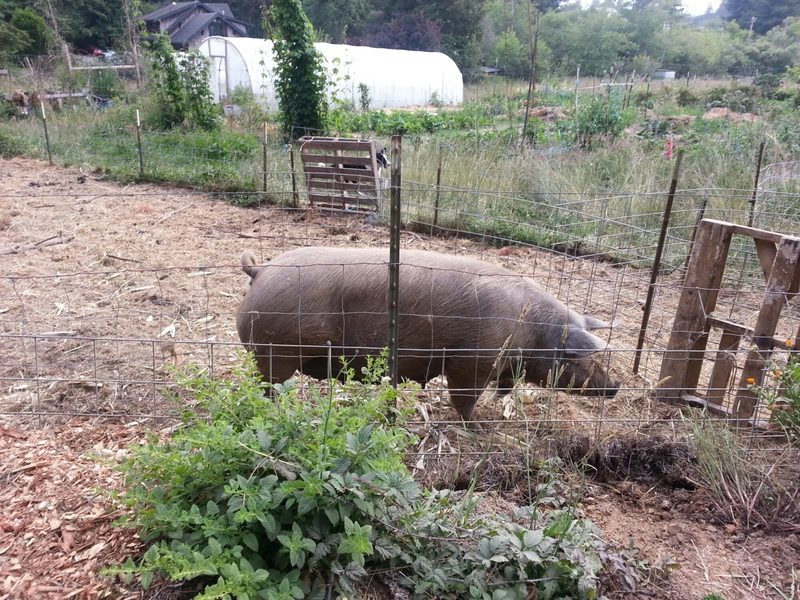 Hogs, cows, chickens, vegetables. The view from my (outdoor) sleeping perch. Tomorrow, Klammath, too stage ourselves for the next big climb to Crescent City, and our exit from California. We’re looking forward to Oregon.